Home > Beaded Curtains & Columns > Crystal Ceiling Drapes > COMING SOON! 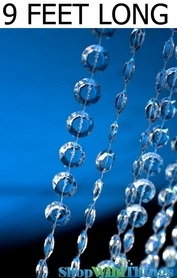 Diamonds Non-Iridescent LED Ceiling Drape & Canopy - Pure White - 15 Feet Long - PREMIUM QUALITY BEADS! COMING SOON! 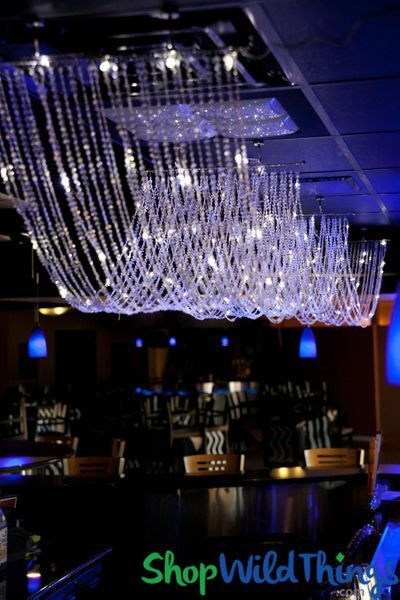 Diamonds Non-Iridescent LED Ceiling Drape & Canopy - Pure White - 15 Feet Long - PREMIUM QUALITY BEADS! 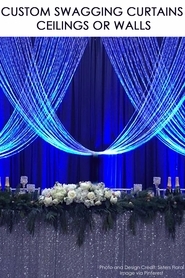 Our Dazzling Diamonds LED ceiling drape and canopy from ShopWildThings is 15 feet long, 20 inches wide, lights up and exudes elegance! The diamond-shaped Crystal clear beads are beautifully pure and luminous and combined with five strands of pure white LED fairy lights, this canopy attracts a lot of attention. The faceted cut of the beads reflect lights from every angle and this canopy will truly transform the look of any room. Two people are needed to install on the ceiling or as a wall backdrop using the four attachment rods with four attach points. Create a canopy or gazebo effect by hanging part of this lighted crystal ceiling drape on the ceiling and letting part dangle to the floor. 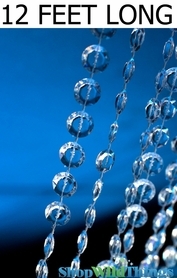 This ceiling curtain has 30 strands of beads with five strands containing LED lights on thin, silver wire. One end of the crystal acrylic bead drape has a plug-in transformer and 50 inches of electrical cord. We love that LED lights are Earth-friendly and cool to the touch. Use standard C-hooks for installation, or use our magnetic hanging hooks for drop-ceilings. These absolutely made our event! Merchant Response:Thank you Gina! We are so happy your event was a success!